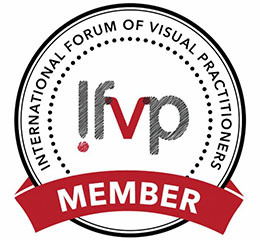 A little while back, the International Fellowship of Visual Practitioners (IFVP) ran a competition for their members to come up with a membership badge, and I’m absolutely chuffed to hear that I won! While it was fresh in my mind, I wanted to describe the creative process for coming up with my entries (including the one that was chosen). In any client-led creative exercise like this, I spend a long time immersing myself in the brief; in this case the strategic intent of the membership badge, the audience types and what they want out of it, as well as where the badge would be displayed, and how it might be received by those audiences’ audiences. I suspected that many people would submit hand-drawn badges — which would still be super nice — but I thought that I’d have to find a visual treatment that balanced ‘professionalism’ with ‘community’. It’d also have to work at small sizes (like email footers), and cope with being printed on various different surfaces (like cloth tote bags, t-shirts, and signage). Of course it had to feature the IFVP logo, but I wanted it to really embrace the spirit of the community, which is enthusiastic about sharing information, supporting each other, and spreading the visual practitioner love into every area, market and domain. So each element within the design had to have significance, and I wanted it to be something that IFVP members would be proud to show. With these thoughts in mind, I ended up doing 5 different designs. Each one started as messy sketches, which I then imported into Adobe Illustrator and used as a ‘background’ on which to do digital designs in vector lines, shapes and text. So there you go! Which design (if any) would you have chosen? What tips do you have about designing something like a community membership badge? IFVP members! Grab the full set of membership badge image files from this page on the IFVP website (you’ll need to be logged in first).